Yesterday I decided to make chili for dinner, and for me there has to be fresh bread to go with chili. Earlier this year I bought The Bread Bible and got my kitchenaid mixer and intended to try my hand at all kinds of different breads. Then spring came and I kind of dropped it -Who wants to be inside when the weather gets nice? Now that it’s cooling off I want to get back into breads. 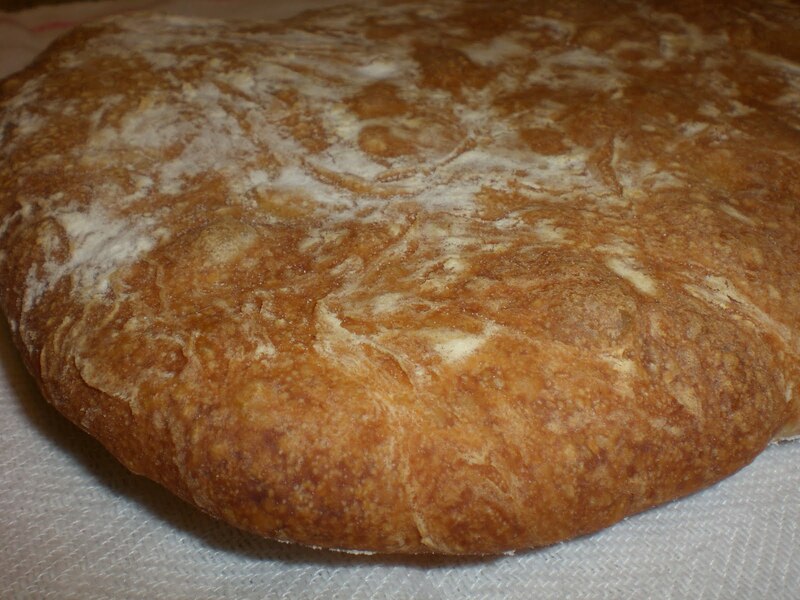 This was my first attempt at the Ciabatta in the book and I think it turned out very well. Nice crisp crust, soft inside with lots of big holes. It didn’t get as high as I expected, but I’m not sure that it was supposed to. Any experienced bread makers out there, please let me know what you think! In a small bowl combine all ingredients and stir the mixture with a wooden spoon for 3-5 minutes or until smooth and comes away from the sides of the bowl. It will be slightly sticky to the touch. Cover the bowl tightly with oiled plastic wrap and set aside until tripled and filled with bubbles, about 6 hours at room temperature. Whisk together the flour and the yeast in the mixer bowl, then whisk in the salt. Add the water and the starter. Mix on low speed until just moistened. Raise the speed to medium-high for 3 minutes, dough should pull away from the bowl. If the dough hasn’t pulled away from the bowl, scrape down the sides. Lower the speed to medium (medium-high if you had to scrape) and continue beating for 2 minutes. Using an oiled spatula, scrape the dough into a large lightly greased bowl. Push the dough down and lightly oil the top. Cover with plastic wrap and allow to rise until tripled, about 1 1/4 to 2 hours. Sift a generous amount of flour onto a counter. Scrape the dough onto the flour using an oiled spatula, and sift more flour on top. Handle the dough gently to maintain as much air as possible. Push sides of dough together slightly using the palms of your hands. 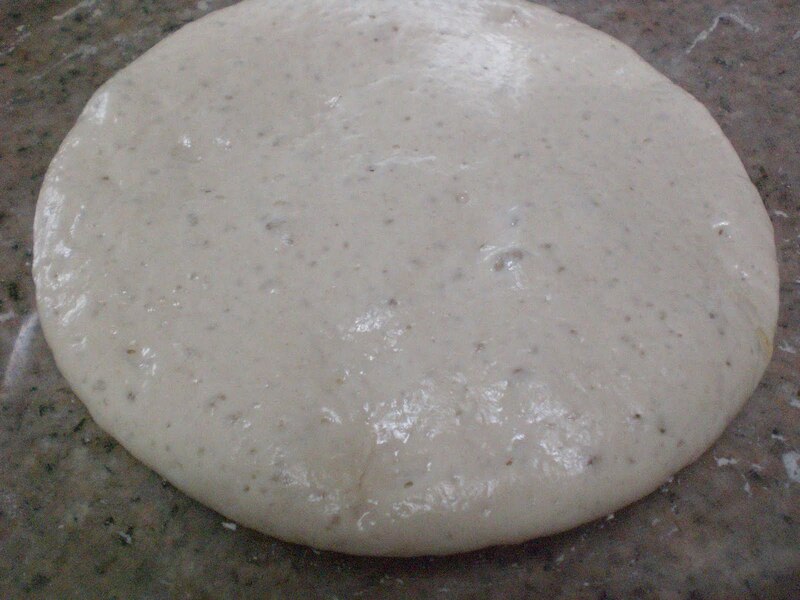 Make large deep dimples in the dough about 1 inch apart using your fingertips, this will elongate the dough. Push the sides together a second time. Carefully lift up the dough and invert onto baking sheet lined with parchment paper. Sift flour over the top and cover loosely with plastic wrap. Allow to rise in a warm spot until 1 to 1 1/2 inches high, about 1 1/2 to 2 hours. Preheat the oven to 475 about one hour before baking. Have an oven shelf at the lowest level and place a baking sheet on it, and a cast iron skillet or baking sheet on the floor of the oven before preheating. Remove the plastic wrap and gently set the baking sheet on the hot baking sheet. Toss 1/2 cup of ice cubes into the pan beneath and immediately close the door. Bake for 5 minutes, then lower the temp to 450 and continue baking for 20 minutes or until the bread is deep golden brown. Halfway through, turn the bread for even baking. I was intimidated before I started, but it really wasn’t as hard as I thought. There are a lot of steps, but they aren’t difficult. I really enjoyed this bread, by itself and dipped in the chili.